He Saves A Defenseless Sloth From Danger Posed By A Busy Highway. He Has A Heart Of Gold. AMAZING! What made the sloth to make a decision of crossing the road? 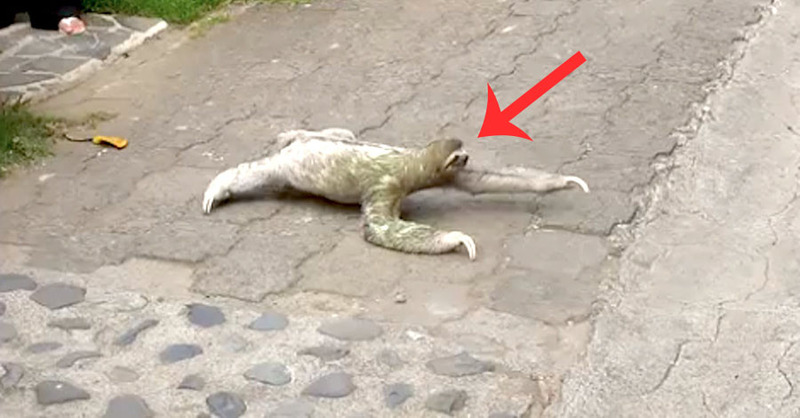 This may sound like a joke but this video features a very slow sloth that’s attempting to cross an intersection which is really busy while vehicles are whizzing by. Fortunately, out of the blues a hero appeared and rescued the poor wild animal. The three-toed sloth attempts to cross the road while the traffic is moving slowly. This happened in Costa Rica. While others were watching the critter, one concerned man stopped the traffic and ensured the sloth crossed safely. The brave man moves towards the sloth and in a careful manner holds the fur at its back and helps him cross the road. Was it not for this man, there was a possibility the sloth could have lost his live. What a hero! Once they are on the other side of the road, he ensure the sloth is fine and then takes his bike and rides away. Seems like the sloth wanted to cross the road and feed on leaves at the other side. This unbelievable hero deserves to be rewarded. So touching!